« Who Gets 67 C-Reactive Protein Tests? I do! Exactly 10 years ago this day, April 6th, 2008, I met my amazing partner, Sharon. We fell in love and married soon after. Whenever we traveled, I would sneak off at different moments to capture a few clips of video with my lip-syncing her favorite song, “Can’t Take My Eyes Off of You” by Frankie Valli and The 4 Seasons. I had no audio aid, was often unshaven & in “vacation mode”, and pretty much never knew just when I’d have a moment alone while she wasn’t looking. But I was very determined to make this happen and show her just how much I loved her with something truly grand and methodical. I should also note my wife is extremely perceptive whereas I am often clumsy and disorganized. So I considered it a high personal triumph if I could keep this secret for the many, many years I was performing this task — and indeed I did… albeit with a few close calls! This morning started as I drove Sharon to Town Square early to be sure we made our 12:15pm reservation for lunch. Indeed, we made very good time and got there at 11:45am — plenty of time to spare. As I well knew, we would be passing our favorite AMC theater on the way to the restaurant. 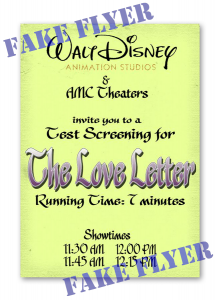 Outside the theater, we were approached by a uniformed attendant inviting us to a screening of “The Love Letter” by Disney Animation Studios. 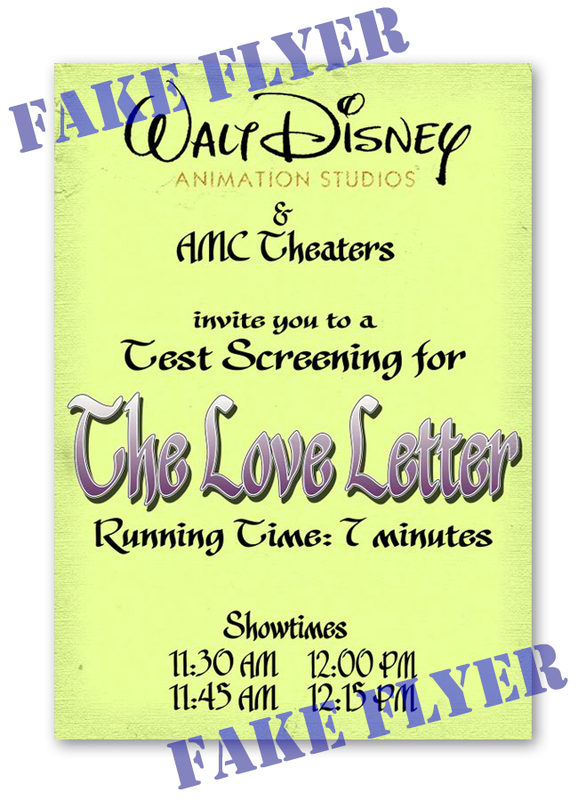 He had a stack of fliers that showed the details: it was a “Short Animation” with a “Running time of 7 minutes”. As my wife is a fan and alum of Disney, I knew well she would take the bait. “Oh,” she turned to me as I was eyeing the same flier, “that will be perfect. We can catch this before we head to the Yard House since we have plenty of time.” I nodded, “Sounds like a good idea.” And I’m quite happy she thought it was hers. After we sat down in the empty theater, there were several minutes that passed where I knew they were queuing the video. I tried to stall as long as I could, but I knew she’d eventually notice I was missing my iPhone if they didn’t start soon — the same iPhone I handed off for them to use in videoing her reactions as we watched. Finally the “short” came on screen and — as designed — it opened with the animated Disney Animation Studios logo for 15 seconds. What followed after you can see in the video below. 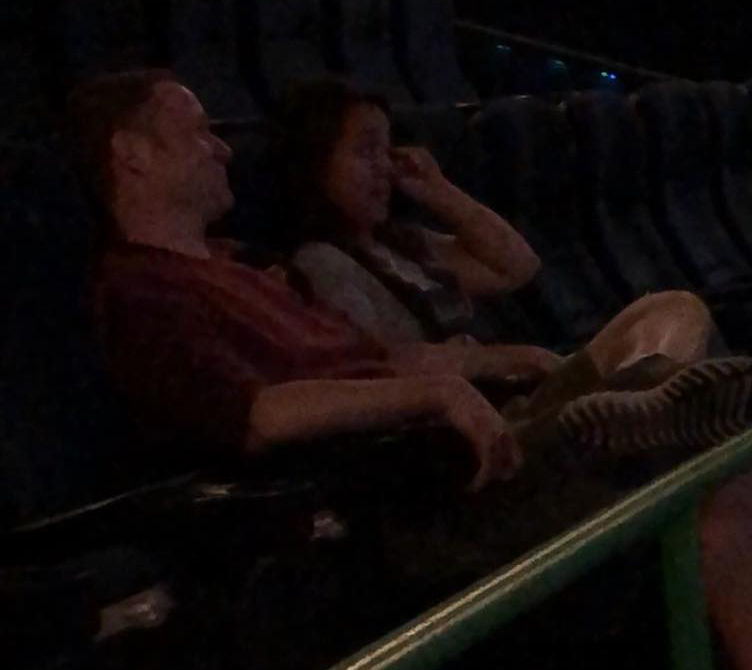 However, what you can’t see is the tears of joy from the wife as I serenaded her from the Big Screen while holding her hand in the seat by her side. It all came together like the fairy tale I wanted to give her all along. This makes us love you even more! I cried! It’s a common side-effect of schmaltz deprivation.